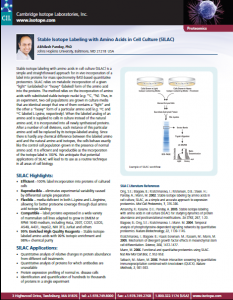 SILAC refers to labeling cultured cells with heavy amino acids for quantitative proteomic tissue analysis. Labeling an entire proteome with heavy amino acids in vivo generates an ideal standard for quantitative proteomics. 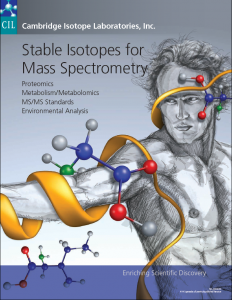 When a heavy labeled proteome is mixed with an unlabeled proteome then digested, every unlabeled peptide identified by the mass spectrometer can be quantified by its corresponding heavy peptide. In SILAC, the tryptic amino acids, arginine(R) and lysine (K), contain heavy stable isotopes, so if digesting with trypsin, every peptide is labeled. This metabolic labeling strategy has been employed by hundreds of proteomic studies.1 The advantage of metabolic labeling over in vitro tagging techniques is that the heavy and unlabeled samples are mixed before sample preparation, preventing variability between preparations distorting the quantitation results. This is especially important when extensive sample preparation (e.g. isolation of an organelle) is required. CK Isotopes Ltd is the largest supplier of SILAC products in the UK and Ireland with next day delivery on many products and extremely competitive pricing for small and bulk orders. All our SILAC products can be found in the literature below and please don’t hesitate to contact us for a quote or to discuss your requirements. Below are the answers to some FAQs as well as a couple of application specific notes that may be of use. Does CIL offer media, kits and reagents for SILAC? How many samples can be tested with the SILAC Protein Quantitation Kit? Each kit contains 500 mL media, which can isotopically label approximately 1 x 1012 cells, depending on cell type. Do you have a protocol? 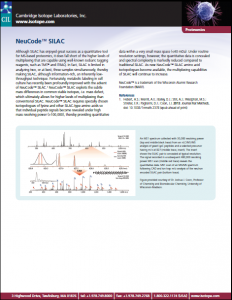 Yes, click here to download the SILAC Protein Quantitation Kit instructions for use. Would 0.8mM of Lysine or Arginine preloaded resins provide approximately 8 synthesis at 0.1mM scale? Yes, theoretically 0.8mM of resin would provide 8 synthesis at 0.1MM scale. Final yields are always dependent on actual sequence and the efficiency of the couplings.